Sometimes I just can’t figure it out. I do know that when my body is fighting off something (a cold, a virus, or the sickness that is going around) I get grumpy. I don’t get sick, but I get grumpy and I don’t know why. It is probably because I am feeling less than 100%, but not sick. 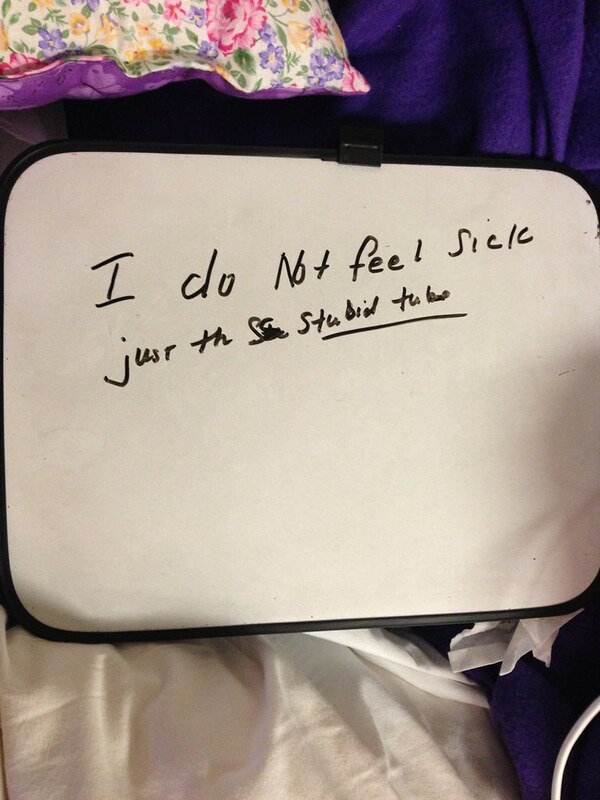 My hubby and I have not actually been sick since last January. Where we got something from the family at the Holiday dinner and it took us down for days. Me – for one and half to be exact. I just went to bed. My hubby took longer to get better because he didn’t just go to bed. He — like most people have to work. I was lucky enough that it hit me Thursday after my class and I didn’t have a class on Friday so I slept all day. I remember it well because I have never just slept like that. I remember I got up once to make dinner and eat, but then I was back in bed. I wanted to get rid of it. Sometimes there are things going on that I allow myself to stress out about. Like when I am learning a new routine. I’ve told you that before. But usually after teaching it for the first time the sense of “nervousness” goes away. Could be that I messed up bad yesterday and forgot to do something I told someone I would do. Never have done that before. Don’t want to do it again. I do know that is really bothering me. But it could also be that thing I am trying to not let bother me. I don’t THINK it is bothering me . . . but I feel odd . . . so it COULD be bothering me. So like I said, sometimes I just can’t figure it out. Is my body working really hard to keep from getting sick? Am I so mad at myself for being forgetful that I can’t forgive myself and have this icky feeling inside? Or is it that THING I am not thinking about? And in not thinking about it, I am thinking about it. I do think that sometimes grief has this “buzz” about it. It might not be there all big and hairy making you cry and wail, but it is there. It makes you edgy. Sometimes even a little jumpy. And it is not so much that I am not thinking about it, it is more that I was going to try not to mention it. But . . . . I think, trying not to mention it and trying to just let it be “not a big deal” is in fact making it a big deal. Grrrr! So . . . not to make a big deal out of it, but to see if putting it out there helps relieve this tightness (almost like heartburn) in my chest and throat I will no longer ignore the THING. Today is my mom’s birthday. She and I are twenty years apart. She would have been 67. I had hoped I would have her around until she was in her 80s, but that didn’t happen. I had thought that my dad and niece and I would get together and do something for my mom’s birthday, but we decided not to. I never know if my dad is just trying to be brave or if he really thinks he is ok. I also had secured tickets to an event this weekend so that had me believing my dad and letting him be. He had a lot of projects he is doing. “Keeping busy” as he says. So really, I wasn’t going to say anything, but like, I said, there is something . . . . I can’t figure it out. So I was thinking NOT SAYING ANYTHING, might be it. Because otherwise I am excited. I have a new Nia class. I mentioned in a recent post that I was going to filling in for someone. Turns out the “filling in” is going to be a permanent situation. Remembering, of course, that “permanent” is still a flexible term. I have to make sure the number of attendees in the other classes don’t go down. A thought I had had, was, having Nia three times a week, might keep people from coming to the other two classes. But today we had a record breaker. So, we will see. There are also a few other good things going on. Perhaps they are good, but causing some stress? I don’t know. Like I said, sometimes I just can’t figure it out. All I can figure out is that there is SOMETHING and I don’t like it. So I am doing things, trying this and trying that to see what works. What do you think? Do you agree with the idea that grief can just hang out and make you edgy? Do you think sometimes it is like that annoying thing you can’t put your finger on? Do you understand it is not always tears and big time sorrow? In addition to oiling my buffet in preparation for Christmas Decorations, I also took down all the “Death Cards”. The top of the buffet was crammed full of cards I received because of the deaths that have occurred this year. 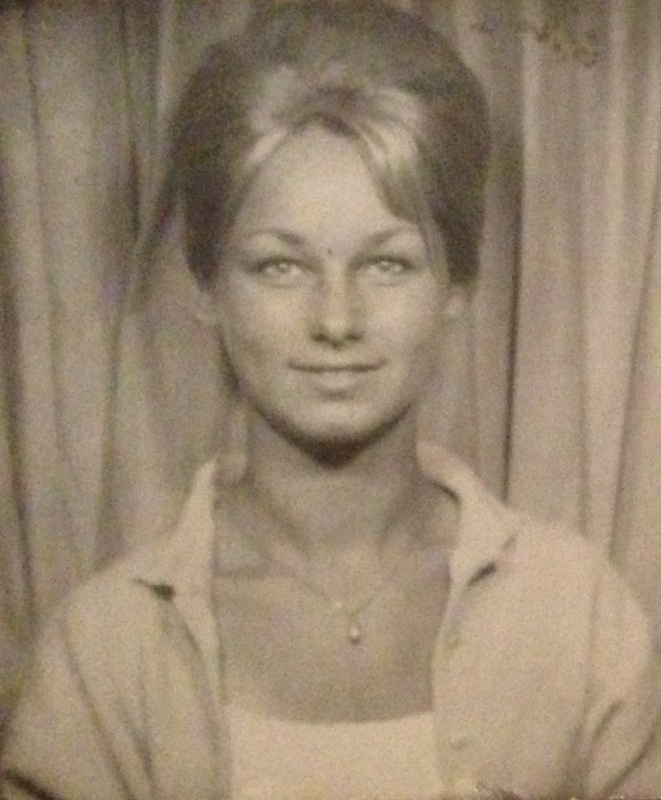 If you have read my blog for a bit you probably know about my mom dying. She died in April. It was sudden to me, yet it dragged out for 10 days while she waited, with a tube in her throat, unable to speak, for the doctors to take the tube out so she could die. But then she didn’t die for another 11 days. I have a separate page here on my blog for her. You are probably aware of the death of our cat. She was so sweet. I like to think she was an angel and I will see her again. I know she did a lot for the people she encountered. But you might not know about my brother. Yeah, he was the first one to die. He died in January. I got a call from my niece saying he was dead. Now, I haven’t mentioned my brother because at the time there was some legal issues or more accurately there COULD have been legal issues. My brother was a widower and a single parent. He and his daughter lived in another state and we needed to get her guardianship and all that stuff taken care of before word got out. My niece has life goals so she wanted to finish her school year up where she lived before she relocated. So she was top priority. By the time everything was straightened out AND I felt like sharing about his death, my mom got sick. I literally was going to post about my brother that week. My mom was waiting to die for a long time (as I mentioned). She went in the hospital for one thing, she was told they could “fix it”, but then they decided they couldn’t and told her she had to decide when to die. Not an easy choice. She picked a day and it didn’t go as they had thought. So that was another process. During all of this I was focused on her. And I thought that (think that) the way people die in the United States is so horrific, I was writing posts about that. I was dealing with all of that. I was not sharing about my brother. Then, our cat died. As I have mentioned in other posts, I am not really a writer. I had never really experienced the “release” people get from writing or journaling. But with posting about my mom and the cat I kinda understood. Plus, it is soooo amazingly helpful to get support from people all over, close-in-person friends as well as people who I have never met face-to-face but have online relationships with. So I was supported by that. 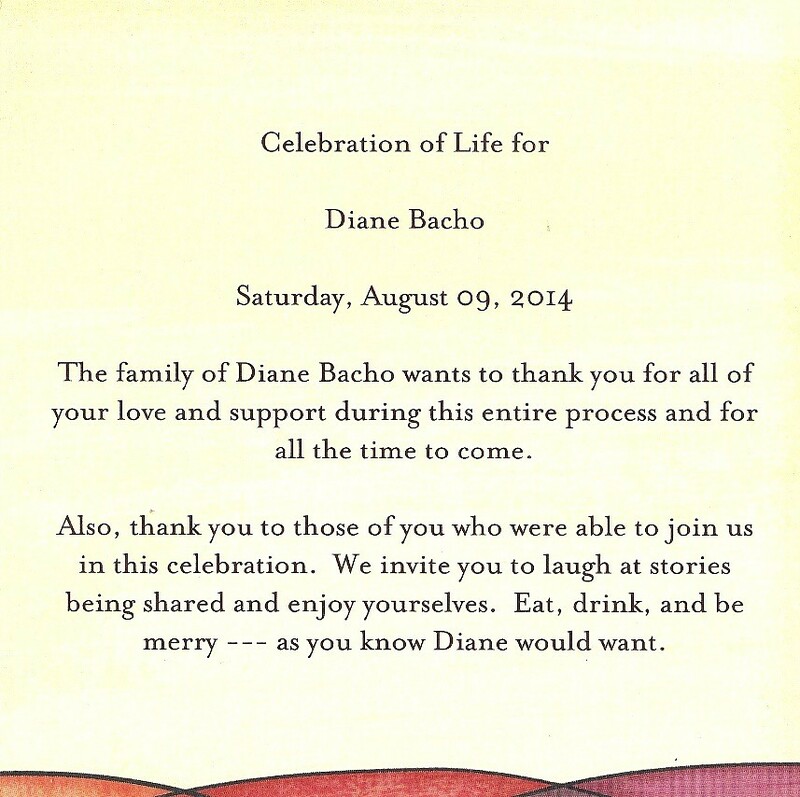 Now my mom’s memorial is over. People keep questioning me about getting another cat. With life moving on, I feel I am ready to share. 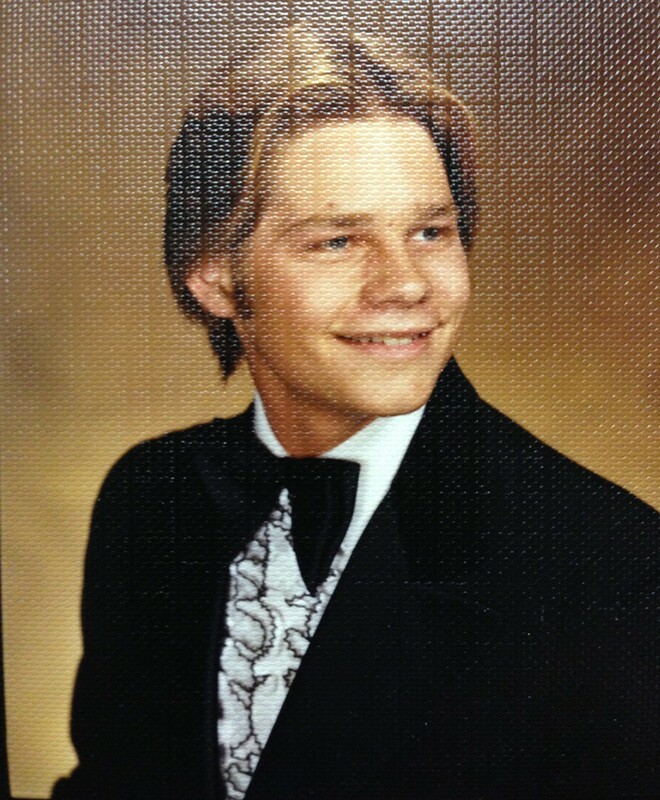 I feel I need to tell the world about my brother’s death. Since I shared about all the other deaths, his should not go unmentioned. I thought it would be appropriate to share now, while I am putting away all the cards of love — because that is what they really are. They are notes and cards of expressions of love ABOUT death. It was so heart-warming to have received those tokens. It is nice to have them still. For those that want more details, because death makes us curious, my brother was 48, he was not in the best of health and he died of an aneurysm. It is ok to be curious. That is human nature. You are welcome to ask more questions if you want. I reserve the right to answer them in a reply on my blog or privately via e-mail, though. There might be more posts in the future . . . but for now here it is. My awesome neice has since been relocated and is doing well. She is awesome because life at her age is “hard” enough without all the stuff she has been given to deal with. We have yet to see how it all turns out. So, take a moment, if you knew my brother or not . . . . . thanks. Everyone is so different. We all have different ways of doing a lot of things. Sometimes we can see things the same way in order to function. We can get along or just go along with ideas and customs to just have peace. Or we can do it for a loved one. But it seems like when it comes to death and our beliefs around it there is sometimes a huge separation. You can be going along in life completely meshing up with everyone around you and then someone dies and BAM! You suddenly don’t agree on anything. The way we all handle death is so different. I understand the five stages of grief*, “popularly known by the acronym DABDA”, (although, I have never heard it called that). I am not saying that I understand each stage in the sense that I have experienced them, I am saying I understand that someone has identified these as stages people grieving might go through. But what people do during these stages and after is still very individualized. Everyone deals with grief differently, I understand that, although I do not agree with how everyone deals with it as you might have guessed if you read Grief Is a Very Personal Thing, where I say people grieve differently and as long as they aren’t mean or causing harm I don’t like to label their behavior unacceptable. This post is not so much about behavior, I don’t think. I know that many people want their loved ones near or they want to be able to visit their loved ones, but I am not one of those people. I think of my loved ones as being gone . . . so having their remains near by is just odd to me. Today I was trying to concentrate on learning a Nia routine and it is one that has the Nia participant turning to face all four walls. So that means I turn to each four walls in the room. I found myself facing the ashes of loved ones at two of the walls. The first and second wall, so by the time I got to the third and fourth wall I was lost in other thoughts. I had been avoiding the room upon my travels through the house. Normally I walk into this room to get to the back rooms because it is the softer path, but I had been avoiding it. But this is the best, the largest room to practice in so I was doing my Nia practice in it. But it just happens to have three of my relatives in it. I don’t care for that. As I type all three of them are at my back. I bet I would not be as conscious of it had I not seen a post on Facebook from a friend who is pretty confident she did not receive the correct ashes of her pet. She posted a picture of the paw print of what she received compared to the pet she had. She has similarly sized pets still so she compared paws. The mold she received was at LEAST four times larger. And she went onto say that she has about three cups of ash. She said she thought her pet would be about one. AHHHHHHHHHHHHHHHHH! It got me thinking. AHHHHHHHHHHHHHHHHHHH! How many cups of people are in this house. WHAT???????????? Sigh. Breathe. Breathe. Breathe. Breathe. Whew. People are so different. 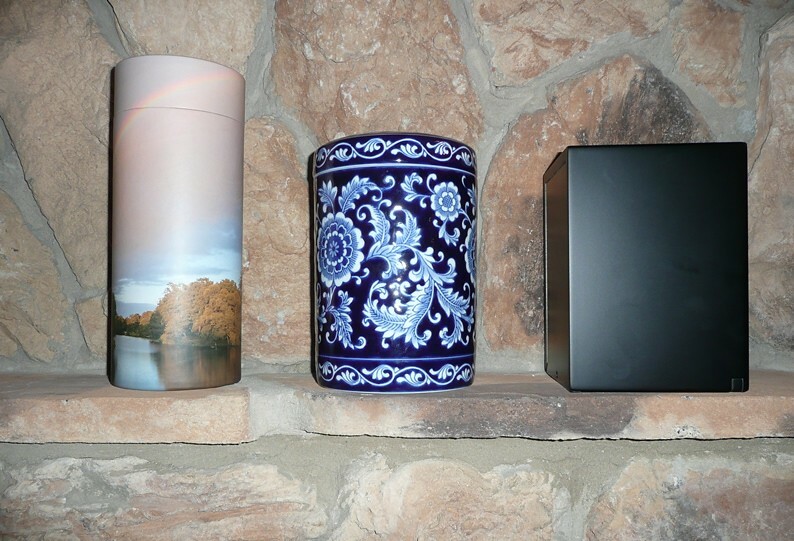 Many people have loved one’s ashes. In fact, they sell beautiful urns to contain these ashes. We’ve (probably) all seen those horrendous comedy TV shows where someone has accidentally spilled the ashes all over. Breathe. I just don’t know what to think about that. I am working on letting people do what they need to do. But, I personally don’t need to do it. I think that tomorrow I will workout in another room — and probably from here on out. I — don’t care to have THAT kind of reminder of my loved ones around. To each their own. And let everyone be . . .
Donna, thanks for always making me laugh, even if it is particularly in horror. Thoughts? What are your thoughts about this? Are you an ashes and urn type of person? Please feel free to share your feelings. I’ve shared mine. Denial — As the reality of loss is hard to face, one of the first reactions to follow the loss is Denial. Truth. This is not from Trainer Terre or Nia Teacher Terre, this is from The-Daughter-Who-Spent-All-Day-Cleaning-Out-Her-Mothers-Closets. Note: this is the second time I’ve type this as my laptop shut down on me. So now all I can say is that I was ok until we watched 47 Ronin which ends in everyone dying — even those in love – and it was more than I wanted to deal with after having gone through a couple of closets and drawers of my mother’s. It was obvious that my mom loved a bargin. Yet she was very fashion conscious. That she cared for her bargins was evident from how she washed her clothes on the delicate wash cycle and how so many of her things were hung up inside out. 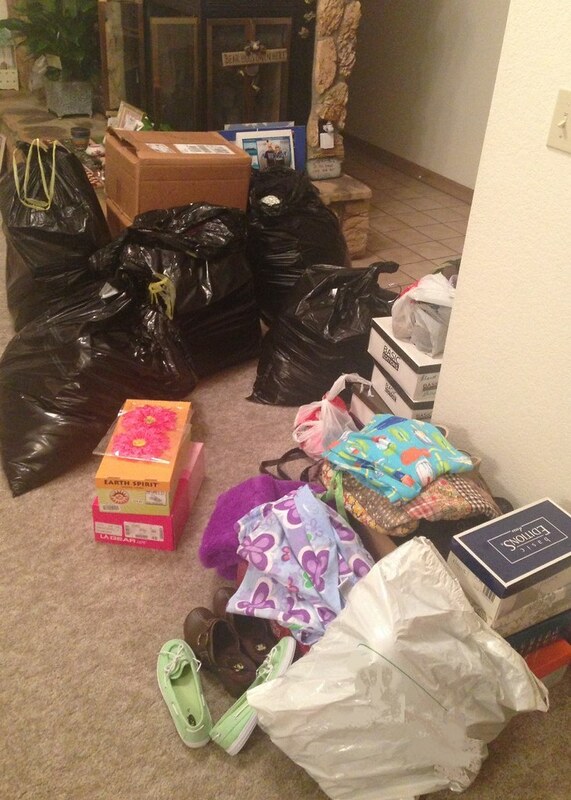 It was obvious how much she cared for the clothes no matter how much they cost. It was obvious – to me – that she thought she would be around a lot longer to enjoy said wardrobe. As I went through each item, so obviously and lovingly cared for, I thought of how much she would have been happy to pass these clothes on to someone who would love them and get use out of them. But we all have our own feelings and ideas of wearing clothes from a dead person’s wardrobe. Many people I contacted were very hesitant. I don’t fault them that, as I said, we all have our own feelings and ideas. But one person’s response brought tears to my eyes. I told her that I might have shoes for her (depending on her size) and that there were earrings that had her name on them. I asked her if she was she interested. She said, “I’d be honored.” After having seen how well my mom took care of her clothes and stuff. And after seeing all the cute shoes she had that I can’t wear because she had such a small foot. After experiencing that weird feeling of, “this person was keeping things for a life yet to be lived”. It was so wonderful to hear that someone would be grateful to receive stuff from her. It made me so happy to think that my mom’s stuff would be enjoyed. Those three simple words made me humbled to be related to such a woman that would speak them. Those words also made me determined to wear stuff from my mom’s closet and fashion jewerly stash to the family’s Easter celebration tomorrow. I pictured myself standing tall in one of my mom’s color coordinated top ensembles with the dangly fashion gold earrings sparkling as I swished my proud-to-be-my-mamas-daughter-head about! —All this from my cousin’s exclamation. Thank you, Cousin for helping me though this. Thank you for helping me feel like my mom and the way she lovingly took care of the stuff that mattered to her matters to someone else too. 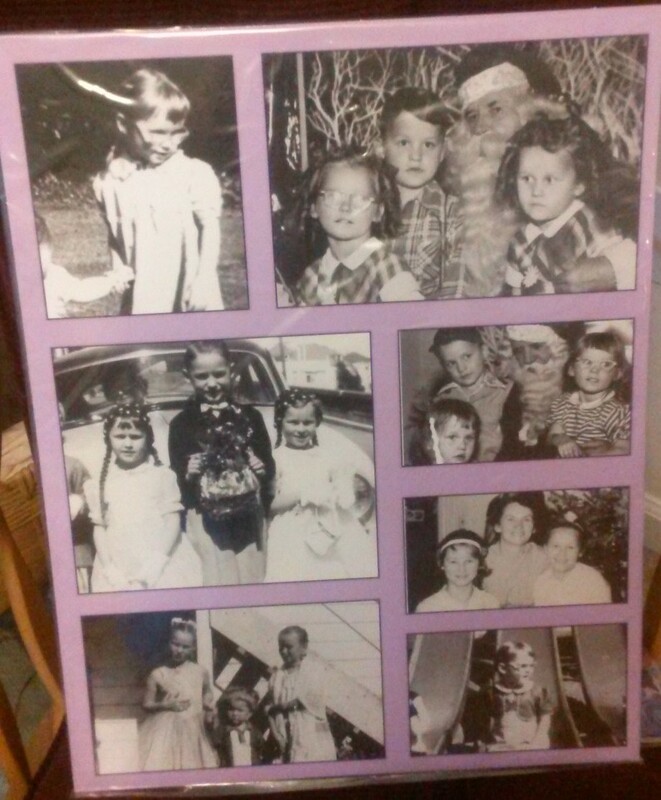 It is very difficult to get rid of things that a loved one had and cared for. When such items can be passed on to someone that will get use of of them, it makes it seem less of a loss–to me. How do you feel? So you think it is great to pass stuff on? Do you want to just throw stuff away? Do you pass it on to Goodwill? Do you keep it forever? What do you think? 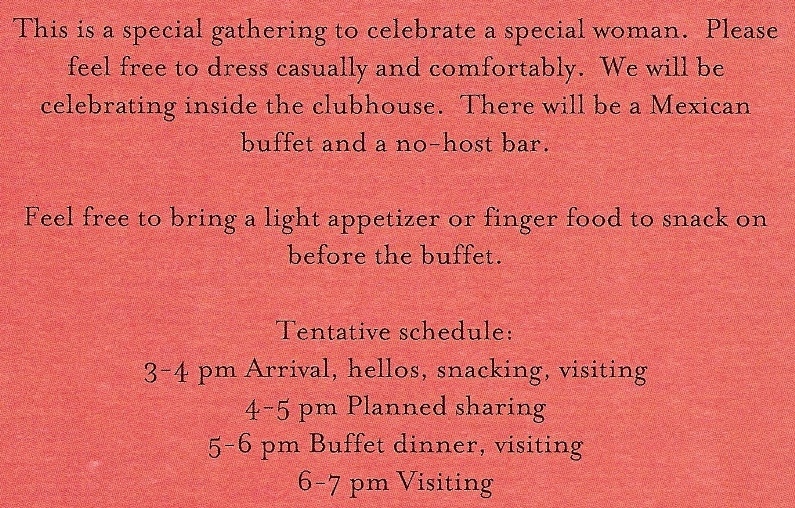 A gathering for my mom is not going to be held until way later, at least four months from now. My father wants it to be after summer and I am not sure why, but at this time that is his present idea. We will see. Things are in flux right now. The “plans” we think we have get changed along with the ideas, so we will see. But regardless of exactly when we have it, it will be, as I said, months from now. I don’t know if it will be big or small . . . I imagine when something is held so many months after a death less people will attend . . . I don’t know. Anyway . . . . since I don’t know what will be happening, I thought I would put a page on my blog for her. 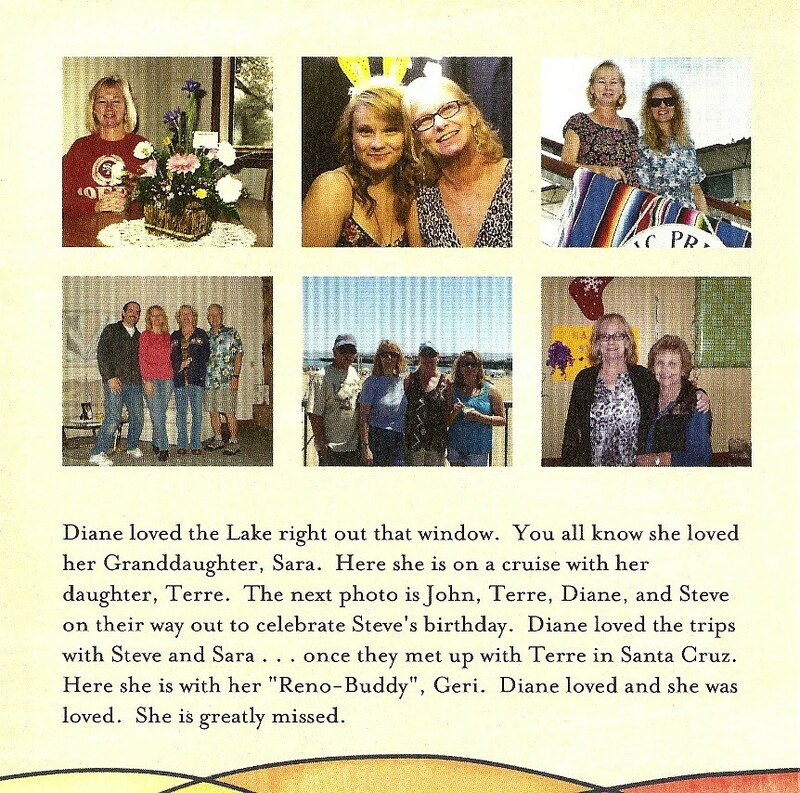 I have had a few people share some stories or memories of my mom and they brought a smile to my face. It is nice to hear nice stories. She was my mom, but as with anyone, you never know everything about them. Plus people have different perspectives so it is always nice to hear how a loved one touched someone’s life. So if you would like to share a story or a memory of my mom, that would be really nice. 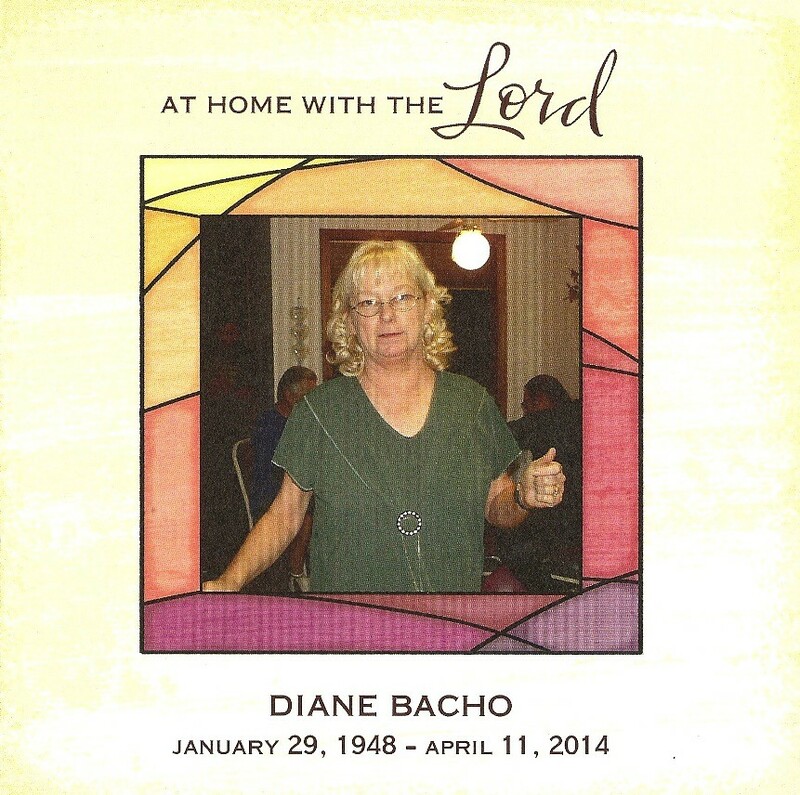 Share it as a comment on the Memorial Page “Diane Bacho – 1948 – April 11, 2014“. I will be moderating the comments, just because there are spammers and scammers. If you don’t have a blog you might be surprised to know some of the things that people comment. I am sure that just because this is about sharing memories of a deceased person that will not stop the spammy comments. So, once you type it, it will not show until I approve it. Again . . . I am requiring the comments be moderated just to keep the spam out, so please feel free to share whatever you like – just understand it won’t show up right away. IF for some reason you don’t want me to make your memory/story public that is ok too, but make sure that you type that in the comment and I won’t “approve it” for publication, I can just read it myself. Or share it with family accordingly. If you have already sent me a note, via FaceBook, or e-mail, would you do it again on the page? Please. Also, I am thinking I will probably end up sharing a few of the stories (I am hoping there will be at least a few) at whatever type of gathering we end up having . . . whenever that will be. If you think of something after you share one comment, please feel free to comment again. The more the better. My father is not on Facebook and who knows if he ever will be. That requires him to sign up and blah, blah, blah, but my blog he can just look at. He does not have to sign up to see it, so if he chooses to check it out he will be able to read the stories and the memories. Not sure he will want to, but . . . it will be here for him if he does. So . . . please . . . share something. And again, I want to thank you all for all of your support, it has been a God-send and has helped me more than you will ever know. 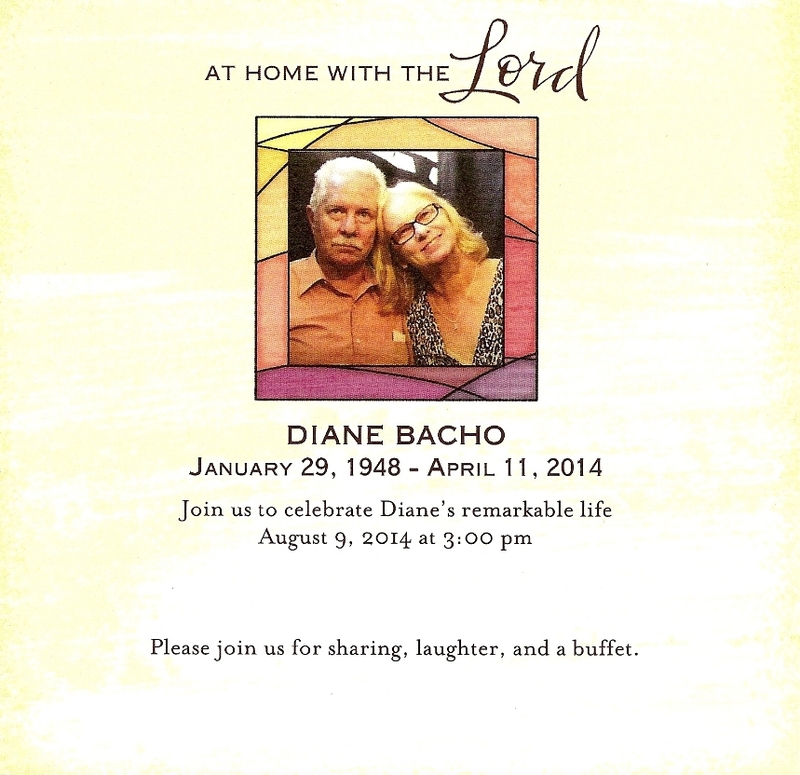 Diane Bacho – 1948 to April 11, 2014 page. I posted some information on Facebook, but there are Nia students that are not on Facebook, but who read my blog. There are also yoga students who I am not friends with on FB who read my blog . 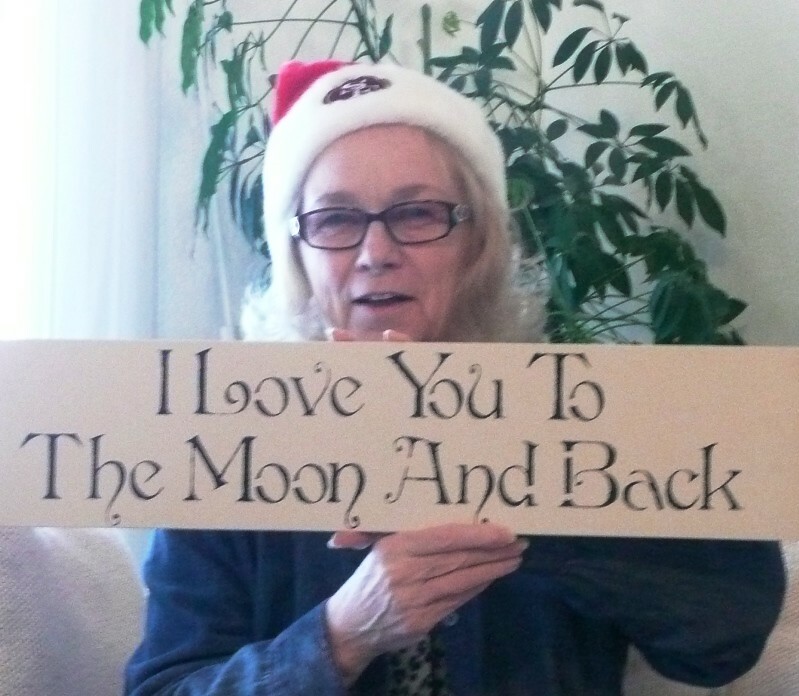 . . and there are many of you who have sent love and support while my mom was dying. I am very grateful for all of the love, support, stories . . . and just everything that has been sent to my family and me. It has helped me more than you know. I will probably go back and tell the story of my mom’s last two years (or so) just because I really feel like sharing the story of the brave woman that she was. Also, it will serve as therapy for me and as a log. I will probably share more about my feelings on this whole “process of dying” that so many people just accept as the way it has to be. I do not agree nor do I feel it is an acceptable way for someone to spend their last days on this earth. 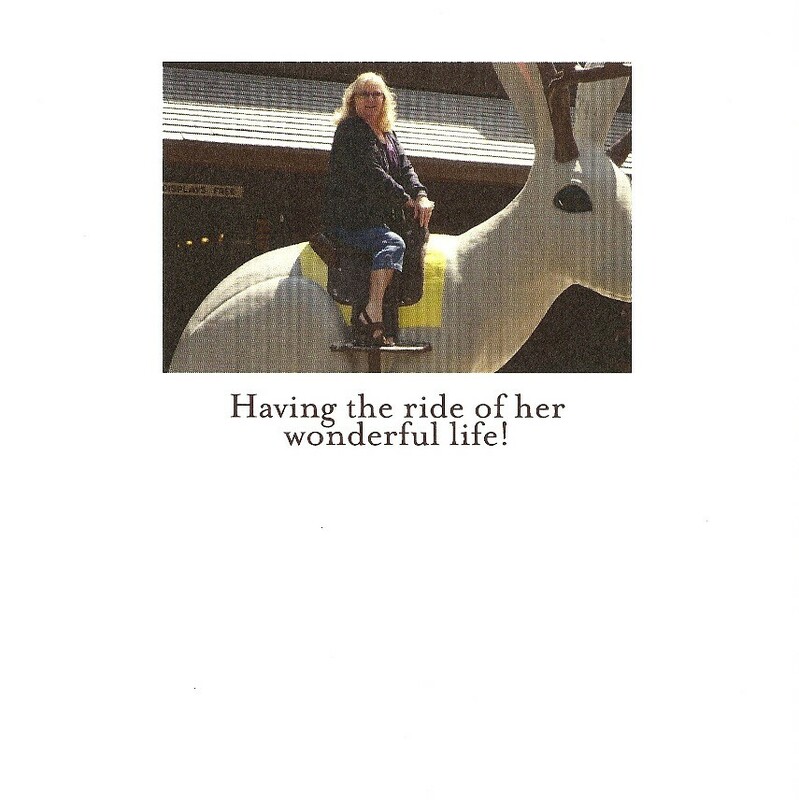 The purpose of this post, though is to share with you that my mom died around 11:00 pm on Friday, April 11, 2014. The hospital called me at a few minutes before 1:00 am on Saturday, April 12, 2014. So I keep thinking date of death is today, but I was told it was about 11:00 pm on Friday. I don’t know the exact time, but that is not all that important. What is important is that she is done with the twelve days of the “process”. She went to the hospital on Saturday, March 22, 2014 because she could not breathe. They placed a tube in her throat to open the airway because they thought that they would be able to do more for her on the Monday. But her team of doctors decided that there really was nothing more they could do. One of her doctors was willing to perform a very risky surgery if my mom elected to go that route, but she did not. So she was told that she needed to pick a day to die . . . the conclusion reached by her medical team was that once the tube was removed her damaged trachea would collapse shortly there after and death would be relatively quick. It was a common occurrence though, for my mother to not do anything according to what the doctors have previously experienced or think would happen. That is just how it has always been. She reacted badly to drugs that no one EVER had reactions to. She was always surprising her doctors and teaching them things by way of her body responding to treatments/procedures/etc differently than they had ever seen. This always served as a reminder to them, over and over, that each body is different. The tube that was in her throat was thought to be keeping her throat open. As I said, the medical professionals thought once it was removed her throat would collapse. While the tube was hooked up to a ventilator it was rarely breathing for her. She was breathing on her own. Only once in a while — when she was tired — did the machine take over. And most often it was only for a few breaths. So she was able to breathe on her own, it was just an airway issue. Because trachea’s can’t be fixed or transplanted she was told she would die and that she needed to decide when that would be. She sat in bed for 10 days contemplating death. All the while she worried about us — did we eat, we should go sleep, etc. She joked with us and allowed us to talk while she listened. The day for the scheduled extubation was stressful and nothing went as planned. In fact it was twelve days after the tube was removed that she died. I want to emphasize that the hospital staff and my mom’s medical team was very kind and caring and they did all they could to make the dying process “comfortable”. My issue with the process is not with them nor the hospital. As I said, that is another post altogether, but I wanted to explain that she received good care. We are now able to enter into the grieving stages of “after a loved one dies” . . . because up until now it was a horrific place of limbo. So, if you are able, please keep up all the wonderful stuff you have been doing. Please keep sending positive thoughts and prayers. Throw over that glitter, sparkle, and shine. I have really been lapping it up and I appreciate it so, so, so, so, so, so much. Make a toast, take a bite, relish the breath . . . . .
Well, I didn’t want to turn this into a blog about death, but I have so many wonderful people asking me what is going on it is just so much more efficient for me to write it out. It saves time and heartache . . . I can just give one update and then point people to this. I don’t have to keep repeating myself. This is turning out not at all how we were told it would turn out. Which is really starting to annoy me because with everything that is now happening the medical staff is saying, “Oh that happens, sometimes.” Really? Well, no one told us that all this stuff might happen. My mom has cancer. The size of her trachea has been reduced due to the cancer. The thought was that it would be reduced and damaged even further by the tube’s insertion and extubation. She had a tube in her throat for 10 days. The tube was connected to a ventilator but it was rarely breathing for her. For most of the 10 days she was breathing on her own, but the medical professionals felt that she would not be able to breathe without the tube. So when they told her she needed to pick a day on which they removed it the feelings were that not long after that she would die. But that has not been the case. The tube was removed at 2:28 pm on Monday, March 31, 2014 and she is still breathing on her own, today is Thursday, April 3, 2014. Some of the “stuff” we were not aware of that could happen, the stuff my dad keeps being told sometimes happens is she is waking up. She wakes up and talks to him. One time it was for two hours (I think that was Wednesday). The nurses say she talks to them. She responds to inquiries about specific meds. She says thank you when then rearrange her. Her brain is not damaged nor is she in a coma, so she wakes up. She is not hooked up to anything, but an IV for fluids. She gets fluids and meds. But she is wasting away . . . as happens to a body that does not get food after six days. A slow drawn out death. I didn’t know that she would wake up and have moments of lucid consciousness. I thought the drugs they administer would keep her unconscious. So I am kind of annoyed that I am missing it. But at the same time I was happy that it was a couple of hours that my dad was able to spend with her. Alone. She was sad that they didn’t make it to their 50th wedding anniversary. That would have been 2015. There are many other things she was sad about but that was one thing she shared. I came home because I was under the impression that it would not go on this long. I was also under the impression that she would just sleep until the end. Everyone copes differently . . . some of us continue on with our lives while other shut down. Shutting themselves away to wallow in sorrow. How people cope is a personal thing. Neither is right or wrong . . . it is just how we deal. I have been lifted up by teaching my classes and moving. My Nia students care and are supporting me. One of my yoga classes, the students don’t know. In one class where I was just subbing they didn’t know, but the peace and serenity in which they practiced REALLY helped me. It was so lovely to see their faces while they held their poses. If it is not too much trouble, please keep your prayers and positive thoughts coming. They really are a source of strength to me. HOLY MOLY!!!! Sigh. Ok, I feel that since I started it, I need to continue with it. Right? I mean, it is not my intention to make my blog all about death, but since I asked for love and support, I think it is only fair that I give you all an update. I sat with my mother in her hospital room for roughly seven days. During that time she was presented with an option that would have been extremely painful and risky. The surgeon gave three scenarios that could occur and two of them pretty much ended with immediate death, so she opted to skip the procedure and just spend her last days with a tube down her throat, unable to speak and unable to cry. She entertained visitors. Not many because it was exhausting to her. She also was asked to pick the day on which she would have the tube removed. The thoughts were that her trachea is so encroached with cancer and would be so traumatized by the tube that when they pulled it out she would not have much time before she died. Regarding the procedure mentioned — for those that are curious — it was a stent. A stent was to be placed in the trachea. The idea was that it would hold open the collapsing trachea so that she could breathe. But, it would only be for a few days. The stent is not a permanent or even semi-permanent solution. It is also metal and rigid, it would not have flexed and moved. It would have been very uncomfortable/painful, because the trachea moves. She did not want to go. She had a lot left she wanted to do. Knowing she couldn’t do ALL that she wanted to do before she died, she thought she could at least do SOMETHINGS. So she decided to have the tube removed on Monday. She made that decision on a Wednesday. It is MY belief that if she knew all that she would have to go through between Wednesday, March 26th, and Monday, March 31st she would not have picked that day. But she wanted to at least get her Easter cards written out. She also wanted to advise me of who gets what in the stack of Christmas gifts she already bought. She also wanted to spend as much time with her family as she could — who wouldn’t, right? But in order to do so she suffered a lot. The medical professionals taking care of her were always there to administer the drugs she needed so she wouldn’t be in pain, but those drugs made her groggy and unable to think clearly so sometimes I think she held off a bit. Plus the procedures that need to be done to allow someone to breath through a tube are not comfortable. So anyway . . .
We got to visit for several days. As I have said several times, she was unable to talk with the tube in her throat. She also was unable to cry because the contractions that happen when one cries caused too much pain. Normally I would not tell someone not to cry because crying is such a great release. I believe crying is good for the BMES – ha, yes, that is a Nia acronym. It helps clear the tear ducts and allows for a physical release. Crying helps clear the mind also. It is an emotional release as well as a spirit helper so to me, it is a good thing. So if you want to cry, cry — except while you are driving or you have tube down your throat and it hurts too much. I was there until Friday night. I got home around midnight on Friday. I came home to do some laundry, teach a yoga class, do some paper work, and pick up my husband. We went back up Saturday night. We visited all day Sunday and waited around for 1:00 pm on Monday. We all were under the impression that at 1:00 pm it would happen. But we all forgot that “hospital time” is not exact. They do things — even scheduled things — around other things. So our 1:00 pm scheduled extubation turned into 2:28 pm. I trusted the medical staff (although it turned out not to be who we were told it would be) would see that she was not in pain, but we still didn’t know if there would be any gasping and gagging and who knows. I was confident that it would not be a long time after. I saw the MRI of the trachea/esophagus area. Nurses and doctors helped convince me that it would be quick. Well it was not. We are going into our 29th hour. While my mom is so medicated she doesn’t know what is going on and she feels no pain . . . this is NOT what she would have wanted. Lingering on. In fact every visitor that came to visit her while I was there, her answer to their comment of “I’m praying for you.” was “Pray that I don’t linger.” Again, I am at a loss. Yes, we all have ideas as to why she has not died . . . . she is not ready . . . . she is doing it in her own time (something we call Natural Time in Nia) . . . ALL TYPES of ideas . . . but really we don’t know. All that I know is that this is really hard on my dad. This is not a case where she might revive and be ok. This is not a hopeful, “Oh, I’ll sit by your bedside until you are awake.” This is a grueling death watch. Judge me anyway you want, I left last night. I didn’t want to see her as I know she would not want to be. I didn’t want to hear the “death rattle”. Ugh! Since it is hard on my dad, if it drags on until the weekend I will go back up. Well, this post is way longer than I like to have my post, but I really wanted to let you know what the status is. Also . . . I guess it helps to write it out. One more thing . . . I believe that I would not have been able to handle this if it weren’t for all of you. So many people have “come out of the wood work” to share and support and deliver sparkles. So thank you all for sharing and caring and giving. I have not been told I am loved or said, “I love you” this much in as many days before in my life. Please keep up with those thoughts, prayers, stories, sparkles, and all that jazz. It REALLY helps!